The couple said "I do" at the beautiful Primrose Court at the Wynn Resort on the Las Vegas Strip. The Wynn Resort, like most of the Strip Hotels, doesn't allow to have an outside photographer take pictures of the ceremony, but the rest of the day we could capture images of the couple and their guests. We started out in the hotel suite with getting ready pictures. This image was taken when the bride is almost ready for the wedding ceremony. 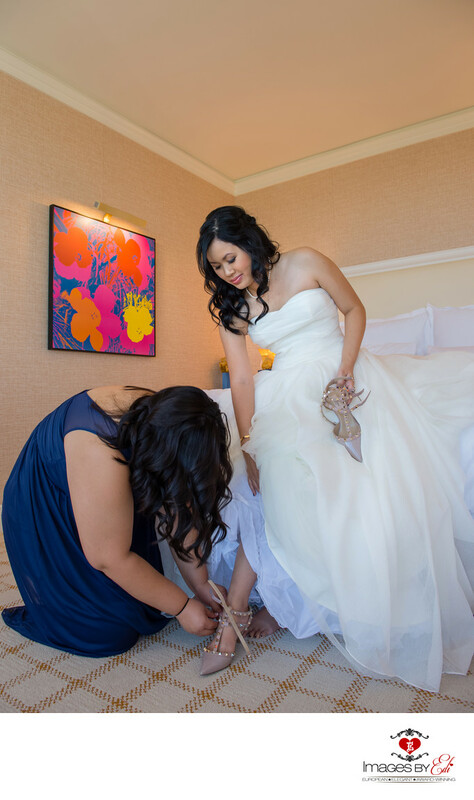 Her bridesmaid is helping to put her shoes on. Location: 3131 S Las Vegas Blvd, Las Vegas, NV 89109.